If you read this blog regularly, you are probably familiar with the fantastic V-tarp project being run by Jerm-IX and Vegas in Vancouver. Recently they were contacted by the manager of customer services and marketing at Translink with a request to stop posting artwork on the Vancouver transit system. This has resulted in what I believe to be an incredible opportunity to engage a municipality in an open discussion about the appropriateness of unauthorized public communications. Below I have relayed the contact letter as well as a link to the responses which Jerm-IX is asking the community to make as public analysis. As well I have relayed my personal response which I have written without edit and from the heart. Please excuse the lack of grammar, sentence structure, and syntax, as I feel the emotive quality of my response demands an immediate post without edit. My name is ------- ---------, and I am the Manager of Customer Services and Marketing at TransLink. 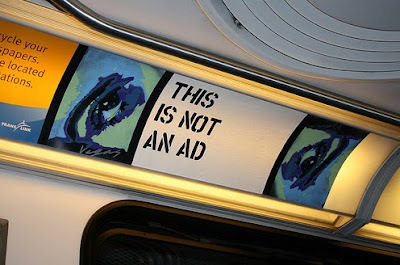 And as you may have already guessed, I’m writing to you in regards to the Vancouver Transit Ad Reclamation Project (V-TARP), your project to install artworks in the spaces used for advertising on our transit system. To be sure, discussions about public space, its intersections with private interests, and its obligations to serve the community are very important. It’s something we think about at TransLink every day, as much of our work in planning and operating our transit system brings these issues of public space to the forefront. However, we at TransLink have a limited budget with which to serve the people of this region. As residents balk at supporting transit through higher taxes, fares, or other fees, advertising from private companies provides an additional source of revenue that helps support our system. So while the issues you raise in V-TARP are important, your project is sadly affecting a key funding source to make its point. By taking over our ad space and posting works that criticize our ads, V-TARP is creating a negative impact on TransLink’s relationship with advertisers, which is starting to cost our system in revenue. As such, we would like to ask if you could bring V-TARP to a close and refrain from posting further works on our advertising spaces. Thus far, our transit advertising agency LAMAR has spent over $3,000 in labour charges to remove the V-TARP pieces. As well, a number of our larger advertisers have called LAMAR with concerns about the V-TARP projects. If the advertising environment becomes inhospitable, these accounts may cancel their contracts with us. Finally, if there are ad campaigns have been booked with LAMAR but are then cancelled before completion, TransLink is on the hook for the costs of that campaign. In the past, pulled campaigns have cost us $10,000-$20,000 in fees. We do recognize the value of art to our system and our community, however, and if there is a way to work together in a way that does not impact our revenue sources, we would be happy to do it. For example, we are trying to expand our Poetry in Transit campaign beyond its current scope, into an Art on Transit program. We would love to work with you and other artists to build something that supports and enhances the public spaces that we all value. Contact me if you would like to discuss the above opportunity further. please excuse my lack of grammar and sentence structure as i am writing this quickly and from a deeply emotional place. what you are doing is incredibly important and i cannot stress enough how emotionally i fell about this recent predicament. this is a fantastic turn of events. like you said in one of the comments on your flikr page in regards to your posting of the translink letter, this is about dialogue and clearly there is one being developed. I think you should decide how you are willing to cooperate. one of the things i think is really important about V-tarp/NYSAT type projects is that they do not ask for permission. Interacting with public space should not require the approval of a larger institution. your mere presence as public citizen should allow you access to that space. These days im coming close to believing in the total decriminalization of all visual interactions in public space despite their performance on what we might consider private property. as far as im concerned, anything that is viewable, reachable from a public sidewalk, or other form of public space is itself public property. your use without permission of the translink system works along those lines and if they were to integrate your work, artists into the art for transit system, it is an admission that public space use is discretionary, something i believe is very problematic. as for their kind, but slightly threatening tone, due to their mention of the damages associated with your work, im not exactly sure what to say. I think it is important to stress the fact that you have not removed any advertisements and therefore have not caused any damage. the translink/lamar employees sent out to remove your work are doing so in haste as they could easily remove them on their regular rounds at no cost. or for that matter they might leave the works up as your work has two positive affects for the vancouver transit system. the first positive is that the residents of vancouver are now subjected to a critical discussion about advertising and public space usage, free of charge. this inherently adds to the vibrancy of public dialogue and therefore the city as a whole. you are creating cultural capitol for the city for free. two the advertisers, once operating in a somewhat dull outdoor media space, commonly ignored by the public, are now presented with a potentially more engaged audience. There are more eyes are on this ad venue because of your work and therefore your work results in positive public attention to their ad campaigns. alas, much of the v-tarp work is critical of advertising methods and intentions but i believe this is not a valid argument for your removal. a public space interested in free speech and therefor healthy political dialogue should embrace criticism and the advertisers should be forced to respond accordingly, not the other way around. if they are threatened by you saying their ads are a lie, well its probably because they are. if the ads were not manipulative and relied more on information than the manipulation of public desire, they would probably not feel as threatened. I would hope that you might strike a positive mediation between your work and the typical commercial ads that happen in the vancouver transit system. There is a middle ground upon which your public dissension can operate alongside a healthy advertising community. if this is not the case, then there is something inherently wrong with advertising messages in that they cannot operate alongside critical analysis. and isnt this the test of properly operating public space? As street artists, graffiti artists etc, we are constantly put on the defensive to protect our methodology. why should advertising not be put on the same pedestal and asked to validate its existence alongside critical thought. i would argue for the existence of illegal street art and public communications for multiple reasons. let the advertisers argue their rightful place amongst your critique and if they find they cannot coexist then there is something inherently wrong with their medium. please note that I am in full support of your project and would like to extend my help in any way possible. I think what you are doing is incredibly important and the recent contact made by the Translink system has raised the potential of what you are doing tenfold. your response to their interest in shutting you down might define this project and its goals more than the continuation of artistic postings. I wish you the best, and again send my full support in whatever way that might unfold. Jordan, thank you again for your continued support and kind words. V-TARP is an idea that has been close to my heart for several years now, and your efforts are appreciated.